I have been asked by many people, how do you grow basil? Basil is quite a common herb, used in many different styles of cooking, but did you know that they are not all the same type? There are several different types, with different fragrances and each one has a different and unique flavour. So best to figure out which one is it that you want before you plant them. The most commonly known and used basil are the Sweet Basil – which you know from your Italian dishes, it has a sweet flavour, the plants grow approx. 14-30 inches tall and love sunny location – and the Sweet Thai Basil – as you guessed, you tasted this one in Thai cooking, its purple stems and flowers give a nice colour patch to your garden, the plants grow approx 14-16 inches tall. One of the questions raised is when to plant basil? Well the answer to this is, as soon as it can be guaranteed that there is not going to be any more frost outside. This can be hard to predict sometimes with the weird weather patterns of late, but generally speaking late spring would be your best bet. You can plant basil from seeds or your can use seedlings from the nursery. It loves well drained soil. So if you are growing your basil in pots, make sure it has drainage holes on the pot, and that you use good quality soil for planting. If you are growing your basil outside, and your soil is a tad bid dense, make sure you add some compost or fine soil to loosen it. Try to plant the seeds/seedlings approx 12 inches apart, to give it enough room to grow. The seeds take approximately 5-7 days to germinate. 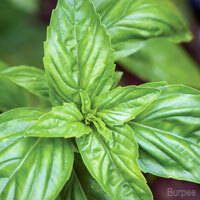 Basil likes water, so you have to make sure that you keep the soil moist, but do not over water! On hot summer days, it is best to water them each morning to keep them moist through the day. If not so hot you can just water them every other day. As with all plants a bit of compost compost goes a long way in adding nutrients to the soil, especially if you are using te same spot to keep growing your basil in. 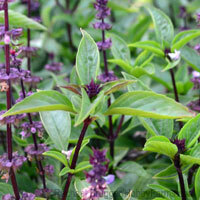 To get bushier basil plants take the flowers off along with two pairs of leaves under them. The flowering creates a hormone change, that reduces the flavour dramatically and also reduces the foliage that the plant grows. The more you prune the plant the more basil you will see, just make sure you don’t pinch the plant too low as you will end up with tall and reedy plants. Always punch the top to get bushier plants. And if you worry about having too much basil on hand, just remember that if you puree the leaves, you can freeze them to last you through colder months. Basil is susceptible to pests unfortunately! As such you need to ensure you keep all creepy crawleys away. You can pick them off by hands if you see them, or if you are looking for a good fertiliser that also seems to repel the bugs also, you can always try a good seaweed fertiliser.